It was supposed to withstand six games, but the field at Lille’s Stade Pierre Mauroy is in almost catastrophic shape ahead of tonight’s Italy – Ireland match. Both sides are unhappy with being forced to play at such turf, but their last group game won’t be rescheduled. Following tonight’s fixture the current field will be ripped out and removed from the stadium. New one is already on its way from the Netherlands and will be complete on Friday. This leaves just one day for preparations as the penultimate game in Lille will take place on Sunday. Germany is the first team to qualify for this Round of 16 tie. The field at Stade Pierre Mauroy is in dire condition despite extensive efforts to prolong its life. Artificial lighting and blowers to imitate natural ventilations haven’t saved it. UEFA reportedly spent €200,000 on attempts to save it, including painting the grass green for TV appearance, but the field is impossible to use further. Several news outlets in France suggest UEFA bares a big portion of responsibility for such state. While the architecture of Stade Pierre Mauroy is hardly helpful (fully enclosed, with limited sun access), it’s reported that the roof was closed too late ahead of Euro 2016, leading to rainfall damaging the field and causing damp inside the building. 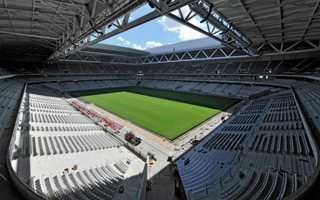 Lille is the worst of four widely criticised fields, though it's believed that no other stadium will require measures as drastic as complete replacement. Stade de France and Stade Velodrome should show improvement by the time they host the Round of 16 games.